It’s a natural process that jewellery changes when it’s used. 3. Protect it from chemicals and cosmetics like hairspray, deodorant and perfume. Always apply them before you put on your jewellery. Silver is a metal particularly susceptible to oxidation and it may change its colour when exposed to light and heat. Changes depend on the exploitation and your skin pH. To clean silver, we recommend special liquids (eg. Argentum) and cleaning lotions. Be careful while cleaning polished and oxidized surfaces. A home method for cleaning soiled silver is using baking soda and toothpaste. Store your silver jewellery away from light in the original package. Stainless Steel is not susceptible to oxidation and is resistant to chemicals. Dirt can easily be removed with water and cream cleanser available in your household. Be especially careful wile cleaning polished surfaces. Dirt can be easily removed. Brass is covered with a thin layer of resin, which protects your jewellery from natural oxidation. Avoid contact with perfumes, and protect against any mechanical damage, as the coating may be damaged. The brass jewellery should be gently cleaned with soft and slightly wet cloth. Gilding of jewellery may undergo natural attrition. This process depends on the frequency of wearing, that’s why you should avoid having the jewellery on while doing the housework and take it off before going to sleep. Gold plating will wear down also when exposed to water, chemicals, cosmetics and perfume. The pH of your skin effects the appearance/look of your jewellery as well. To reduce the risk of mechanical damage, always store jewellery in a dedicated package. Abrasion of the gilding wouldn’t be subject to any complaint, but it is possible to re-gild jewellery and restore its initial appearance if necessary. Chrome plating like gold plating is exposed to natural attrition. In order to keep your jewellery in a good condition avoid putting it on when working around the house and remove it when going to sleep. Jewellery should not get into direct contact with chemicals – for example perfume. To reduce the risk of mechanical damage, always store your jewellery in a dedicated package. For maintenance and renovation, you can gently wipe it with a soft cloth soaked with a baby oil, then gently wipe off the excess of the liquid with a dry cloth or a paper towel. If the jewellery is heavily soiled or you are not sure how to bring back its glamour, give it into professional hands. 1. There are many different ways to determine the size of a ring. The most accurate, and also recommended by us, is a measurement 1. with the use of calibrated ring sizers. It can be done in our Showroom or any other jewellery store. 2. If you cannot measure your ring size this way, or you are buying a ring as a gift for your loved one, the size can be determined based on an already owned ring, through putting it on a ring mandrel. It can be done in our Showroom or any other jewellery store. 3. Measuring the diameter or circumference of the ring finger at home is another, but usually less accurate method. The diameter should be measured with a precise ruler, in the inner edge of the ring. You can compare the result with the table below. The circumference of your finger, you can measure it with a narrow strip cut from a stiff paper. It should have a width of about 0.5 cm and a length which would be sufficient to wrap tightly around the widest joint of your finger. The point, where the edges come together on the finger should be taped to make sure that the position of the paper strip will not change when removed from your finger. You can then cut the paper ring, made in this way, expand the paper strip and measure its length. Result – the circumference of your finger, now you can compare to the table below. The thickness of a finger may slightly vary depending on external factors. Measurement should not be taken in the morning and late in the evening or during hot weather. Fingers can be swollen and the result will not be accurate. An engagement ring, according to the tradition, is worn on a ring finger of a left hand, and wedding ring on a ring finger of a right hand. Fingers can vary in size. The measurements taken with a home-made method, may not be accurate. We offer two types of bracelets: closed and with a split. 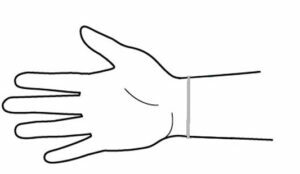 Bracelets with a split are easier to apply, they also give a possibility of partial regulation of the size and self-adjustment to fit your wrist. The most convenient method of donning this type of bracelets is to put it with a splitted part on your hand next to the thumb, and then moving it diagonally towards the wrist. The bracelet can be gently bend if needed. Closed bracelets are not suitable for self-adjustments. You put them on through the wrist. To choose the right size of a bracelet, measure the circumference of your wrist. This can be done for example by using a measuring tape, or a string, that you can then measure with a ruler. If you’re not sure which size to choose, or you want to buy a custom size bracelet- please contact us. 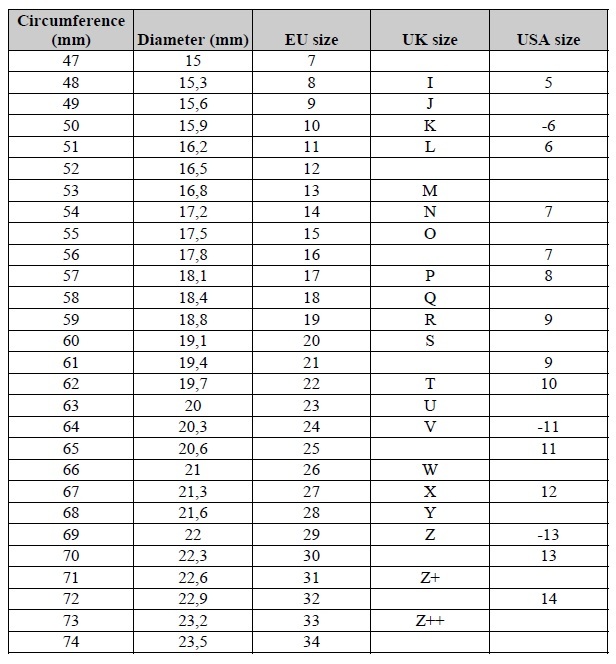 For some bracelets, there is only one size, so there is no possibility to select the size while ordering a product. There are also bracelets that are available only in sizes S and M and in that case the L size will not be displayed as a possible option to choose from. In case of pendants, the total length of the chain is always given in the description. The look and the location of the pendant on the body, will vary depending on the circumference of the neck and the height of the person who wears it. 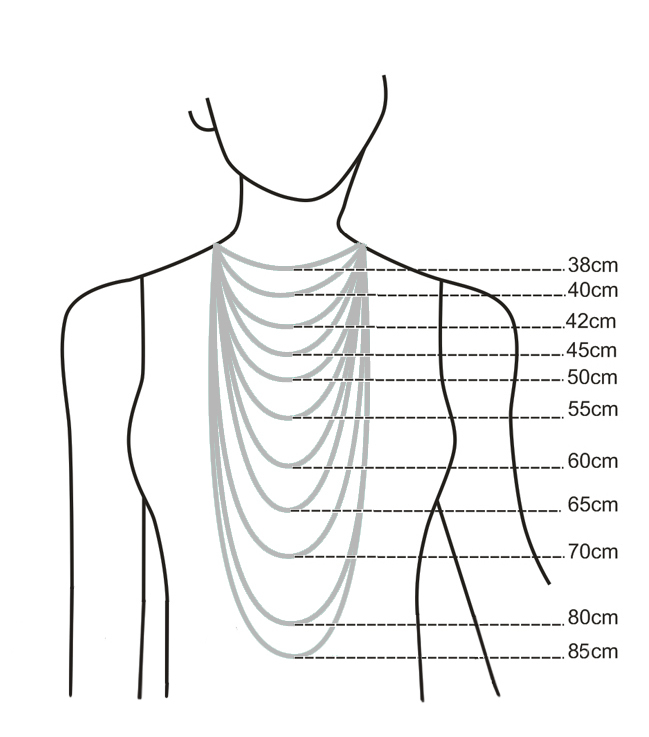 The following graphic will help you in a preliminary assessment of the length of the necklace. If you want to buy a custom sized necklace – please contact us.